GasMastor is a modular system, and as such is sized to suit any mobile application. Again – either LPG, CNG, or LNG can be used – and tanks are fitted to suit the gas type and required range. LPG is usually the preferred gas for mobile/transport applications. LPG is readily available through existing fuel distribution infrastructure and is easy to transport. For transport applications a typical substitution rate with LPG is 20% to 25% to deliver optimised emissions and maximum fuel savings. Significant reductions in CO2, NOx and particulates. 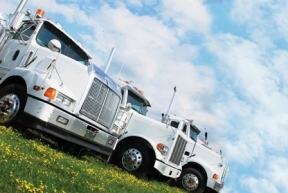 Substituting more expensive diesel with a cheaper gas delivers significant $$$ savings. Using a flammable gas to encourage complete combustion greatly increases the efficiency of the engine. Soot is the abrasive by-product of combustion. Lower soot build up extends engine life. Engine oil analysis allows an extension of maintenance intervals and lowers life-of-engine maintenance costs. The additional gas supply effectively extends the range/running time of the engine.